Researchers in the UK, Japan and the Netherlands have fabricated the most functionally complex integrated quantum circuit ever from a single material, capable of generating photons and entangling them at the same time. The circuit consists of two photon sources on a silicon chip that interfere quantum mechanically. Its inventors say that it could be used in quantum information processing applications and in complex on-chip quantum optics experiments. Quantum interference is at the heart of many quantum information processing algorithms and technologies. However, to observe this uniquely quantum-mechanical effect, the photons employed need to be indistinguishable – that is, they need to be identical in every possible way. They also need to be produced from identical photon sources, something that has proved difficult to do in the past. 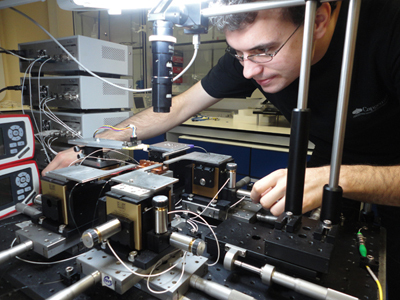 A team of researchers led by Mark Thompson of the University of Bristol in the UK has now succeeded in overcoming this hurdle and has managed to realize two identical photon sources on a single silicon chip for the first time. "These sources produce entangled light – which we can control – and quantum mechanically interfere on the same chip," explains Thompson. To generate the photons on their chip, the researchers began by injecting a strong infrared pump laser beam into it. The beam produces photon pairs via a nonlinear interaction with the silicon material in a process called spontaneous four-wave mixing. 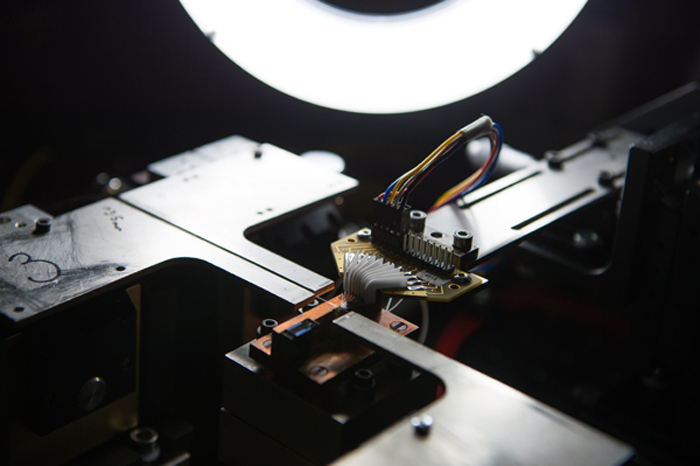 "We injected the beam into two regions on the chip (these regions subsequently become the two sources) and combined the quantum light produced using a beam-splitting element, also on the chip," said Bristol team member Josh Silverstone. "We precisely controlled the path length travelled by the photons through one of the sources by changing the temperature of one of the two waveguides contained in the chip and observed quantum interference fringes." These fringes are a signature pattern of two-photon quantum interference, he says. A big advantage of silicon quantum photonics is that these structures can be fabricated using methods that are very similar to those used to make modern CMOS microelectronics, Thompson says. "Our particular circuits were made by Toshiba in Kawasaki, Japan, using standard silicon fabrication techniques, but any CMOS foundry could have been used. In the long term, we could even envisage quantum photons and standard electronics integrated on a single chip." Thanks to its circuit, the team was able to examine quantum interference between two on-chip photon sources for the first time. The sources show extremely high quantum interference, which implies that they are exceptionally well matched. "Such good matching is a prerequisite for building any larger scale quantum-optical system," says Thompson. 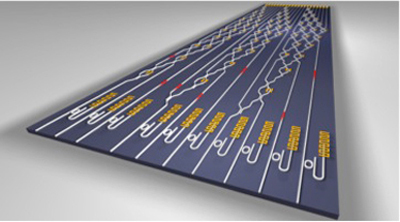 The circuit made in this work could also be used to perform more complex on-chip quantum optics experiments than those possible in bulk or fibre optics. "There are even wider implications for the future, however, in that many photon pair sources might be combined on individual silicon chips and work together in a highly efficient way," adds Thompson. The team, which includes researchers from the University of Glasgow in Scotland and the Kavli Institute of Nanoscience at Delft University of Technology in the Netherlands, now plans to combine the elements needed to make fully integrated photonic quantum information systems on a single device. "So far, we have combined quantum sources with quantum circuits, but the next big challenge will be to include single photon detectors, and then scale up to the many hundreds of on-chip components required to perform complex quantum information processing tasks with photons," reveals Thompson. The circuit is described in Nature Photonics 10.1038/nphoton.2013.339.